While some choose to sail the seas and oceans seeking trade, adventure, and fame, others are more daring and sail the skies of their worlds. Discover the wonders of flight and the beauty of sailing the winds from many diffrent methods and in many diffrent forms. After all, no one race dominates the skies... save those that need no ships and jealously guard their skies. 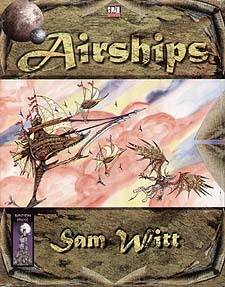 Like sea captians traversing dangerous waters and unknown menaces, airship captians must face the wrath of the aerial realms in the forms of dragons and other invisible dangers that pose great risk to their airships.